Loudness Normalisation is unavoidable. No longer is it advantageous to limit the master into oblivion. Most services will turn it back down again, revealing all the distortion caused by ferocious limitering. At present, Youtube, Spotify, Tidal, and iTunes, along with broadcasters and other streaming services, are all employing some form of loudness normalisation. Understanding the effects of the encoding and normalising of each of these services is more and more important to ensure your music sounds great everywhere. 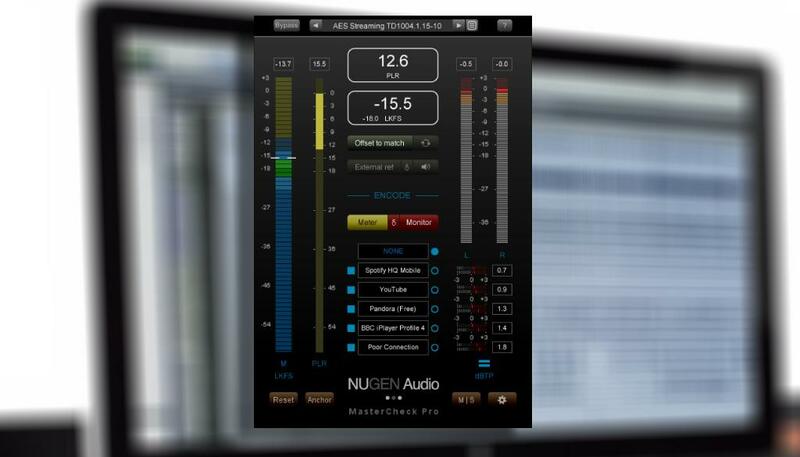 MasterCheck Pro by NUGEN Audio, now at version 1.5, is a loudness meter with a number of extra functions, which really help ensure you know what’s going to happen to your mix on a number of platforms. While there are plenty of available meters, both paid and free, MasterCheck Pro offers you a number of extra features difficult to find elsewhere. I have found with the meters I’ve tried that often the important values aren’t immediately obvious and take a bit of work to find, but NUGEN Audio clearly taken the time to make the wealth of data clearly visible and easy to understand. While the plugin has a theme of dark colours, the important numbers are placed deliberately and clearly in white, at the top centre of the plugin. That all-important integrated loudness value, switchable between the American standard LKFS and the European LUFS, sits underneath (as of v1.5) the newer PSR (peak to short-term loudness) value. While the more traditional PLR (displayed above a meter on the left hand side of the plugin) gives an overall understanding of the microdynamics within a track or album, PSR is a really helpful guideline for spotting and avoiding adverse compression or limiting effects in shorter, louder sections within the track. To the left is a meter showing the short term and integrated loudness, and a short term PLR meter (with the integrated value above). On the right is a stereo true peak meter, with the peak levels displayed above. They haven’t stopped there though, and the extra features MasterCheck Pro boasts set it apart from other available meters. Most notably, at the bottom of the screen is a section whereby, using the supplied presets, you can audition and meter an array of different date compression codecs in real time. The demystifying of lossy compression’s effect on your audio is wonderful – straight away you can see if a particular codec will cause the track to clip, even if the original peaks well below 0dBFS. To be able to monitor the encoded audio in real time is a bonus, great for checking up on what a low bitrate will do to your audio. You can even monitor the difference signal between codecs and your original track! Scrolling through the supplied presets gives you the codecs for all major platforms and broadcasters, including in v1.5 Apple’s AAC. The presets will also set the target loudness level, shown just under the integrated loudness value, for the varying platforms. Using the Offset to Match button you can instantly hear how your audio’s level will be altered once it goes through the normalisation process. When mixing it’s easy to trick your ears into believing a plugin has made things sound better, when in fact you’ve just made it louder. MasterCheck Pro can help ensure you’re making positive decisions in your mix/mastering chain by placing their SEND plugin at the start of the chain. Setting the Send as the external reference for MasterCheck will allow you to measure and offset any changes in loudness, so you can AB to hear exactly what the processing is doing. I think MasterCheck Pro is a great loudness meter. Crammed full of useful features, the interface is still clear and concise, conveying a great deal of information without feeling overwhelmed by data. To be able to quickly check up on how broadcasters or codecs will affect the sound of your mix, without having to dig around the internet to find their practices, is a huge time saver. Also, the ability to create your own presets, set your own target level and choose your own custom set of codecs will no doubt save even more time. The only caveat for me is the delay caused by the encoders, which, while varying depending on the particular formats loaded, maxed out at a whopping 200ms in Pro Tools. If you don’t need the encoders running it’s possible to bring the delay right down using the standard MasterCheck presets, which removed it entirely in the case of my 2016 MacBook Pro. MasterCheck Pro is a great Swiss army knife loudness measurement tool, which I would certainly recommend to those serious about maximising the quality of their work across varying platforms. $199 + taxes. For further info please visit the official website.